Velvet is a virtual electronic piano that combines five legendary electric pianos from the 60s and 70s into one versatile instrument. Based on the Fender Rhodes Suitcase, Fender Rhodes MK I and MK II Stage Pianos, Wurlitzer 200A and Hohner Pianet-T, Velvet accurately emulates the sound quality, response, and nuances of each original instrument to bring your piano tracks to life. Additionally, Velvet features a pallet of onboard effects and allows you to control every aspect of the sound for unparalleled realism: turn up the tube drive controls in the preamp section to warm up your tone; adjust the timbre, dynamic response, and velocity curve to customize the playing feel; and mix in the sound of pedal and other keyboard mechanical noises to recreate an authentic electric piano track. Using proprietary dynamic modeling, a unique combination of optimized sampling and modeling techniques, Velvet is capable of producing highly realistic recreations of classic electric piano sounds with superior fidelity and dynamic response. Additionally, Velvet features the revolutionary Vintage Mode that allows you to tap into the timeless sounds heard on countless classic recordings. Vintage Mode intelligently tweaks the timbre setting to readjust the sonic character of Velvet to match these electric pianos from the past. With the Vintage Mode, you can sound just like your favorite electric piano players. Velvet features a built-in preamp and an array of effects to add crunch, ambience, or tremolo to your electric piano track. Its powerful preamp section includes tube overdrive, compression, and a custom 3-band EQ with a parametric mid band to shape your sound. Process your sound further using a wide range of distortion, wah/filter, chorus, flanger, phaser, and tape delay effects to emulate a vintage sound or forge something new. The Ambience, Spring, and Room reverbs can add an expansive ambience to create otherworldly effects, or a small room reverb to add a bit of color to your performance. You can also add tremolo and autopan effects; the former is modeled after those on the original electric pianos. 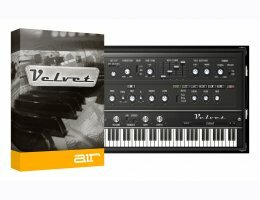 Velvet includes 350+ professional presets meticulously programmed by AIR Music Technology's sound designers that make it easy to call up authentic electric piano sounds. You can even create your own unique presets by dialing into Velvet’s powerful controls. The graphic user interface is reminiscent of vintage electric pianos, and its controls are modeled after the originals, allowing you to easily modify sounds at the twist of a knob or notch of a slider. iLok optional - authorization may be had on a computer or iLok 2 or 3 dongle.